You can't go wrong with these "Hand Fitted PVC mats to add good looks and function to your FJ40. These mats are a unique and "Exclusive CCOT Product". PVC mat material has been specially formulated for CCOT to be thicker than stock or common automotive floor material. Each mat set is hand fitted and cut before shipping. CCOT has developed a "3-Piece Overlap" front mat pattern that fits so cleanly together in the front floor pan that with a casual glance, gives off the appearance of being a one piece mat. Front mat seam lines are hardly noticeable. 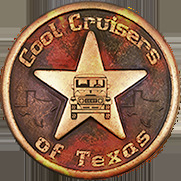 Removable mats make your FJ40 very easy to clean and because mats fit together so tight you can conceal a layer of insulation under mats (see below), reducing road noise & engine heat. Order mats (9/'72 to '78) with or without factory transmission holes located and pre-cut. Pre-cut holes will not work for 3 speed transmission. This FJ40 mat set fits floor pan tight like a molded mat. Rear cargo mat measures 40 5/8" x 40 5/8". 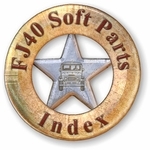 Rear mat is cut square (without rear heater notch) to accommodate those FJ40s without rear heaters. Note: These mats will not fit late model ('79 to '84) FJ40s with the emergency "Hand Brake" mounted on the transmission hump. Each mat set is hand fitted (in an FJ40) and cut by Mr. Neill (CCOT's #1 Assembly Man, 10 yrs.) before shipping. Mr. Neill has developed a "3-Piece Overlap" front mat pattern (not shown) that fits so cleanly together in the front floor pan that you would believe it's a 1-Piece molded mat. Front mat seam lines are hardly noticeable. Removable mats make your FJ40 very easy to clean and because mats fit together so tight you can add a layer of insulation under mats (see below), reducing road noise & engine heat. This mat set features our New Cargo Deck Mat. 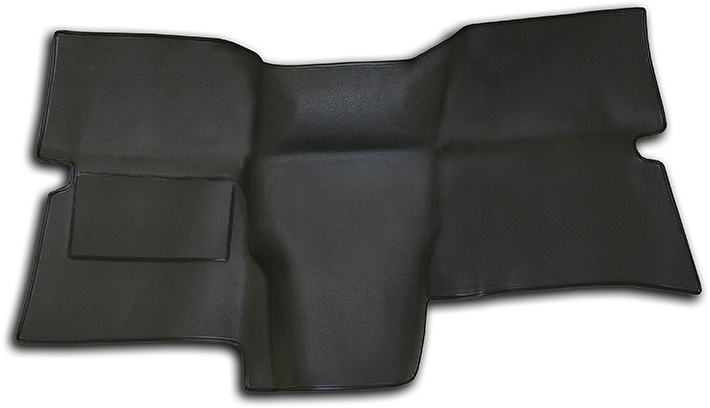 Order mats ('9/72 to '78) with or without factory transmission holes located and pre-cut. Pre-cut holes will not work for 3 speed transmission. Order mats (9/'72-12/'78) with or without factory transmission holes located and pre-cut.